The TCP/IP protocol suite is so named for two of its most important protocols: Transmission Control Protocol (TCP) and Internet Protocol (IP). 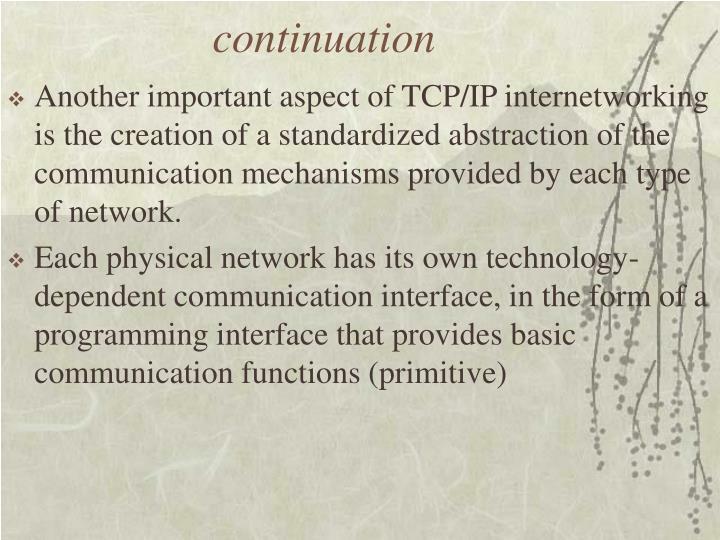 The main design goal of TCP/IP was to build an interconnection of networks, referred to as an internetwork, or internet, that provided universal communication services over heterogeneous physical networks. The clear benefit of such an internetwork is the enabling of communication between hosts on different networks, separated by a large geographical area. 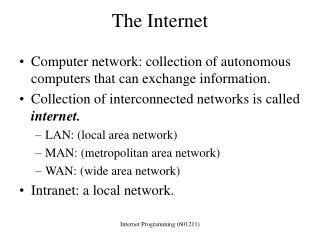 The words internetwork and internet are simply a contraction of the phrase interconnected network. 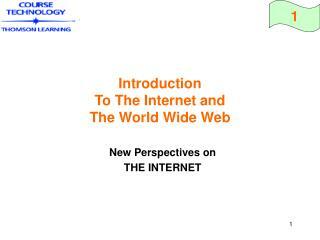 However, when written with a capital "I", the Internet refers to the worldwide set of interconnected networks. 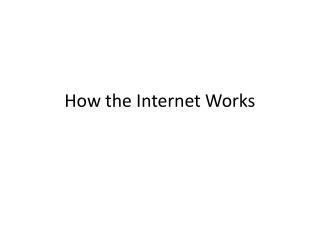 Hence, the Internet is an internet, but the reverse does not apply. Backbones: Large networks that exist primarily to interconnect other networks. 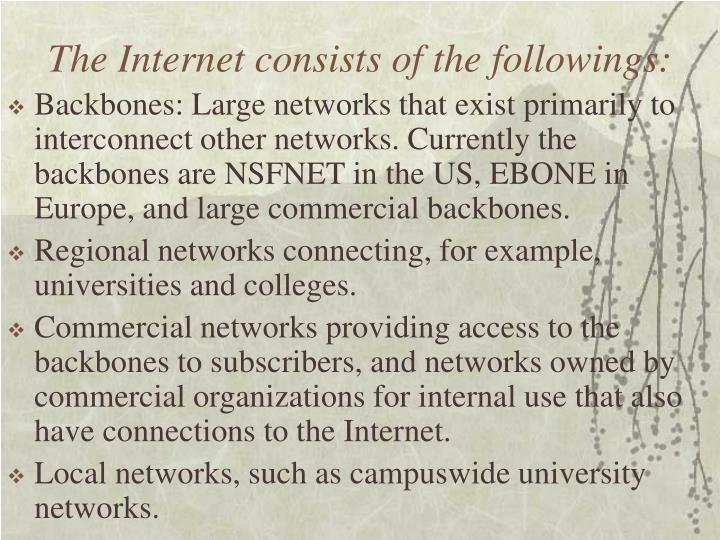 Currently the backbones are NSFNET in the US, EBONE in Europe, and large commercial backbones. Regional networks connecting, for example, universities and colleges. Commercial networks providing access to the backbones to subscribers, and networks owned by commercial organizations for internal use that also have connections to the Internet. Local networks, such as campus­wide university networks. 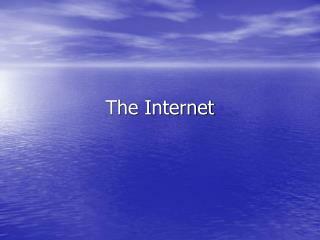 or by the applicability of the network to certain environments. 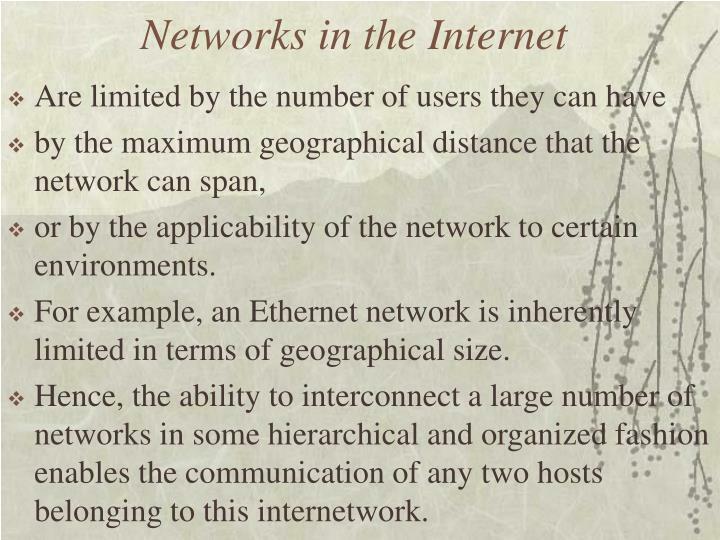 For example, an Ethernet network is inherently limited in terms of geographical size. Hence, the ability to interconnect a large number of networks in some hierarchical and organized fashion enables the communication of any two hosts belonging to this internetwork. Another important aspect of TCP/IP internetworking is the creation of a standardized abstraction of the communication mechanisms provided by each type of network. TCP/IP provides communication services that run between the programming interface of a physical network and user applications. 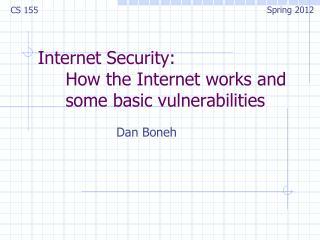 It enables a common interface for these applications, independent of the underlying physical network. 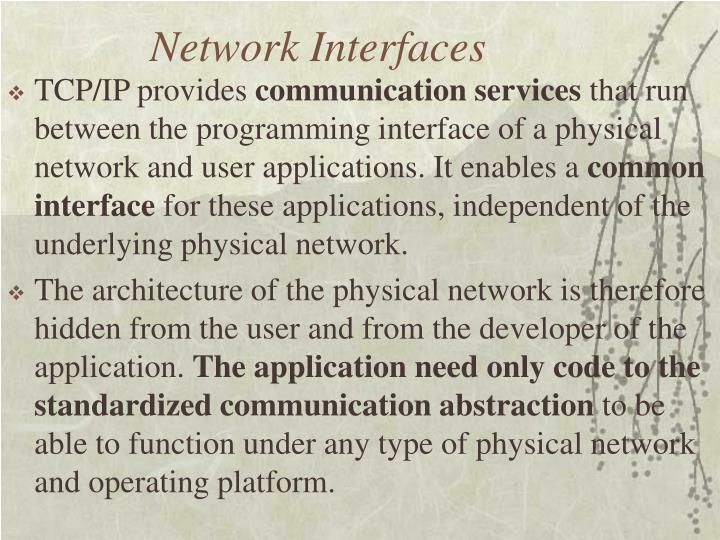 The architecture of the physical network is therefore hidden from the user and from the developer of the application. The application need only code to the standardized communication abstraction to be able to function under any type of physical network and operating platform. to be able to interconnect two networks, we need a computer that is attached to both networks and can forward data packets from one network to the other; such a machine is called a router. 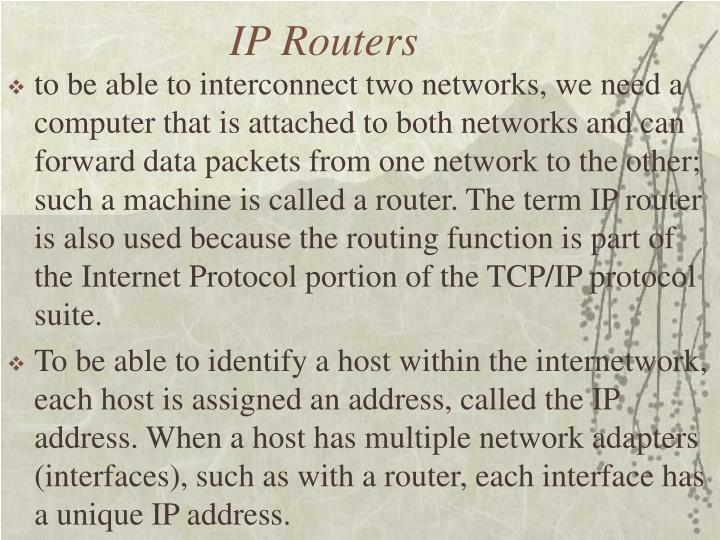 The term IP router is also used because the routing function is part of the Internet Protocol portion of the TCP/IP protocol suite. To be able to identify a host within the internetwork, each host is assigned an address, called the IP address. When a host has multiple network adapters (interfaces), such as with a router, each interface has a unique IP address. 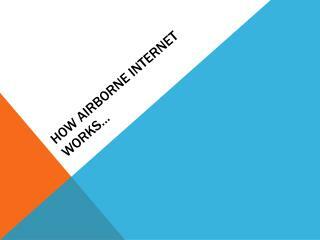 The network number part of the IP address identifies the network within the internet and is assigned by a central authority and is unique throughout the internet. 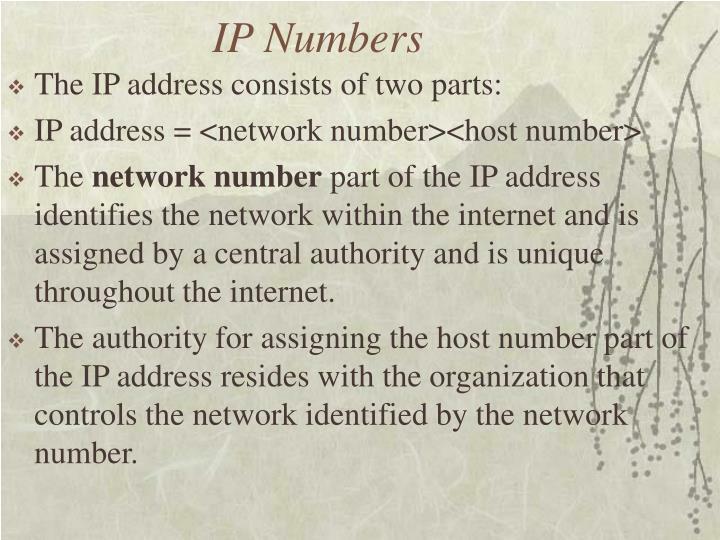 The authority for assigning the host number part of the IP address resides with the organization that controls the network identified by the network number. 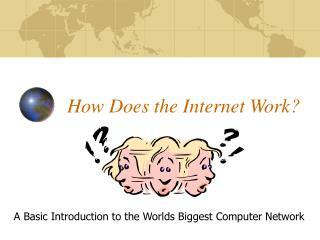 is provided by the program that uses TCP/IP for communication. An application is a user process cooperating with another process usually on a different host (there is also a benefit to application communication within a single host). 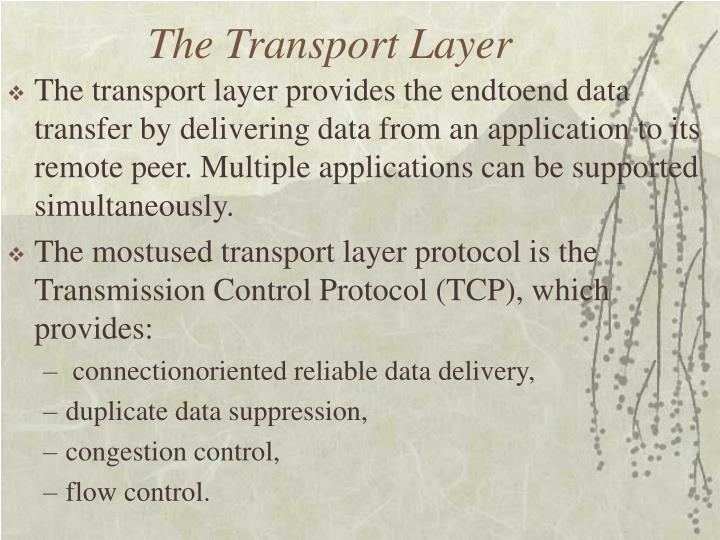 The transport layer provides the end­to­end data transfer by delivering data from an application to its remote peer. Multiple applications can be supported simultaneously. congestion control, if it is so desired. Usually, UDP is used by applications that need a fast transport mechanism and can tolerate the loss of some data. 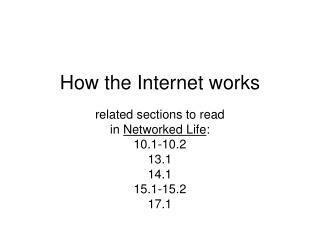 also called the internet layer or the network layer, provides the "virtual network" image of an internet (this layer shields the higher levels from the physical network architecture below it). 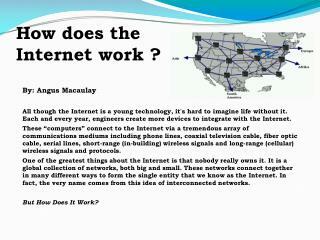 Internet Protocol (IP) is the most important protocol in this layer. It is a connectionless protocol that doesn't assume reliability from lower layers. IP does not provide reliability, flow control, or error recovery. These functions must be provided at a higher level. IP provides a routing function that attempts to deliver transmitted messages to their destination. 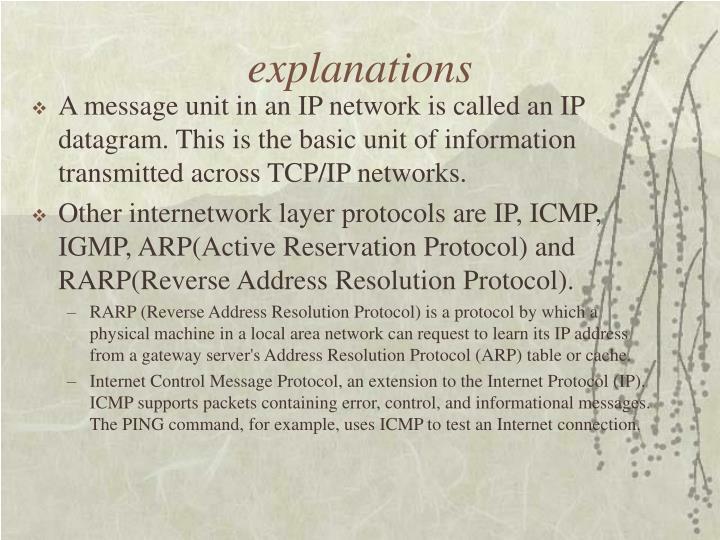 A message unit in an IP network is called an IP datagram. 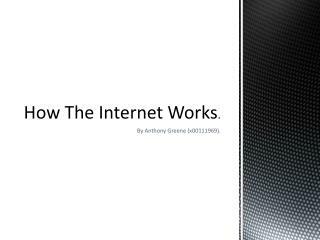 This is the basic unit of information transmitted across TCP/IP networks. Other internetwork layer protocols are IP, ICMP, IGMP, ARP(Active Reservation Protocol) and RARP(Reverse Address Resolution Protocol). RARP (Reverse Address Resolution Protocol) is a protocol by which a physical machine in a local area network can request to learn its IP address from a gateway server's Address Resolution Protocol (ARP) table or cache. 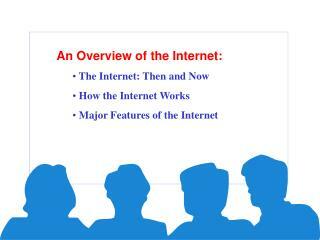 Internet Control Message Protocol, an extension to the Internet Protocol (IP). ICMP supports packets containing error, control, and informational messages. 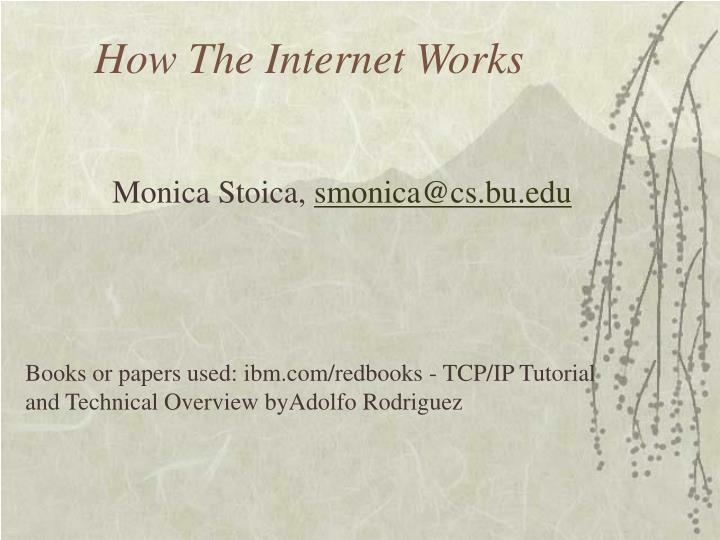 The PING command, for example, uses ICMP to test an Internet connection. 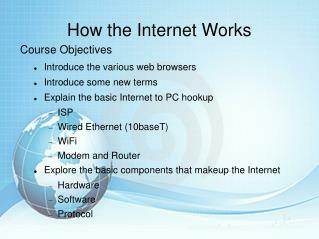 also called the link layer or the data­link layer, is the interface to the actual network hardware. This interface may or may not provide reliable delivery, and may be packet or stream oriented. 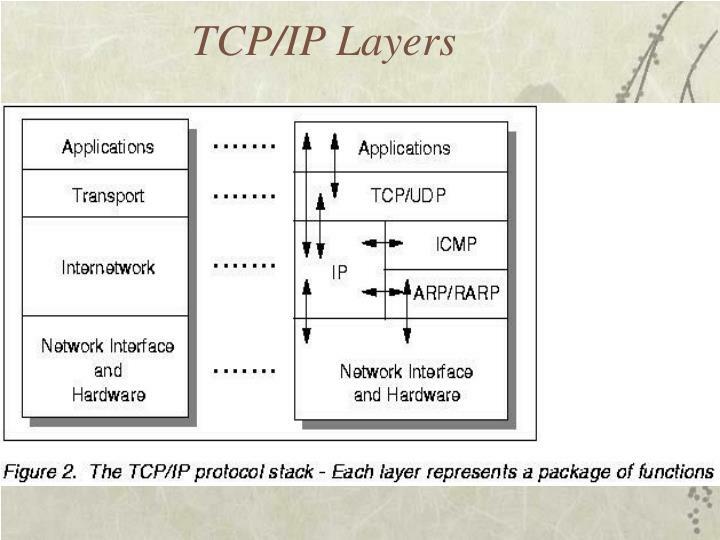 In fact, TCP/IP does not specify any protocol here, but can use almost any network interface available, which illustrates the flexibility of the IP layer. 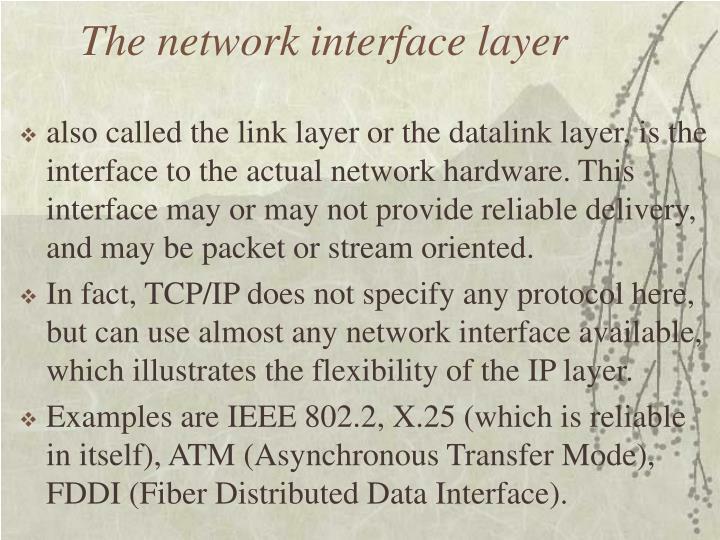 Examples are IEEE 802.2, X.25 (which is reliable in itself), ATM (Asynchronous Transfer Mode), FDDI (Fiber Distributed Data Interface). 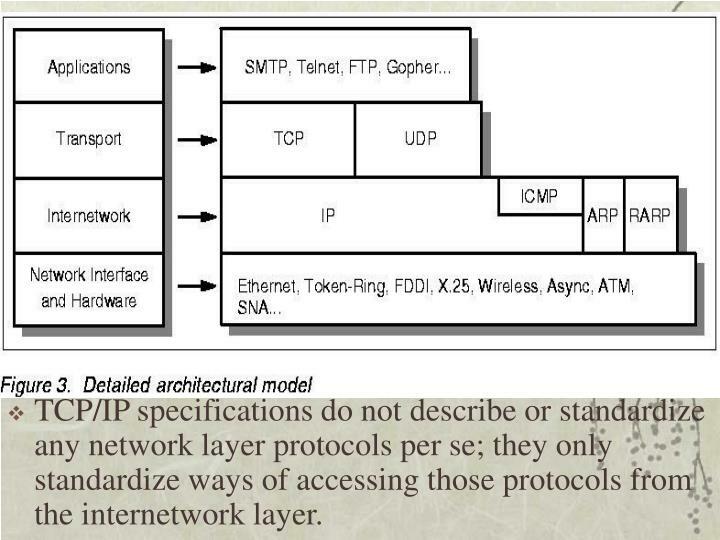 TCP/IP specifications do not describe or standardize any network layer protocols per se; they only standardize ways of accessing those protocols from the internetwork layer. ­ TELNET for interactive terminal access to remote internet hosts. ­ FTP (file transfer protocol) for high­speed disk­to­disk file transfers. 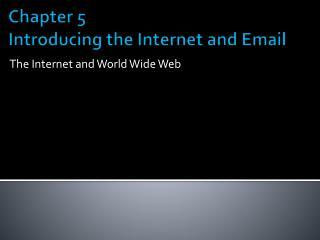 ­ SMTP (simple mail transfer protocol) as an internet mailing system. These (telnet, ftp) are some of the most widely implemented application protocols, but many others exist. 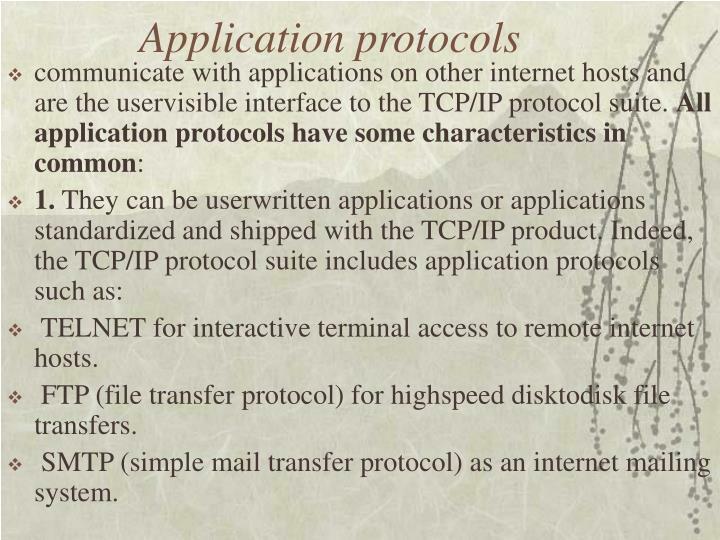 Each particular TCP/IP implementation will include a lesser or greater set of application protocols. 2. 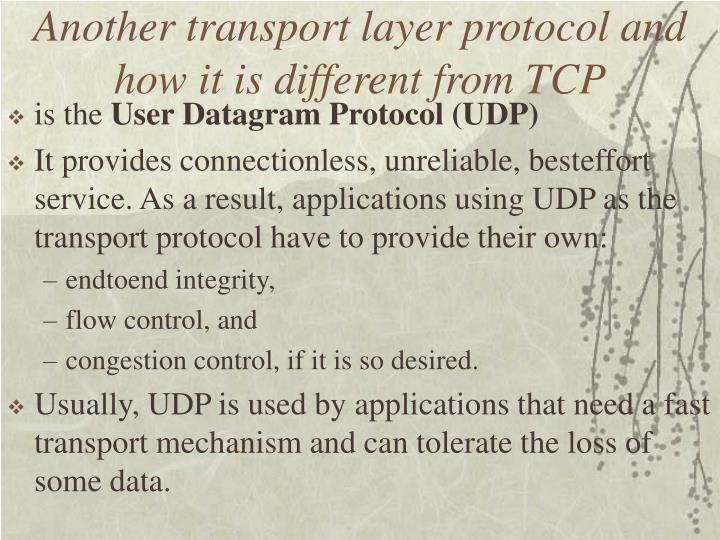 They use either UDP or TCP as a transport mechanism. 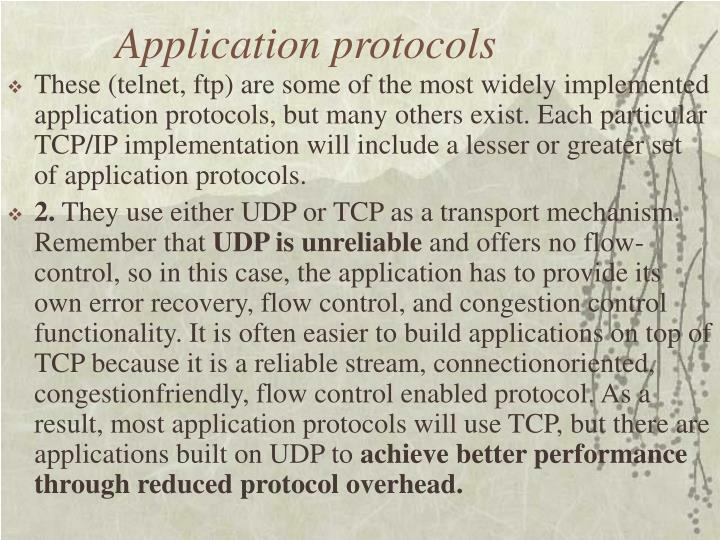 Remember that UDP is unreliable and offers no flow­control, so in this case, the application has to provide its own error recovery, flow control, and congestion control functionality. It is often easier to build applications on top of TCP because it is a reliable stream, connection­oriented, congestion­friendly, flow control enabled protocol. As a result, most application protocols will use TCP, but there are applications built on UDP to achieve better performance through reduced protocol overhead. 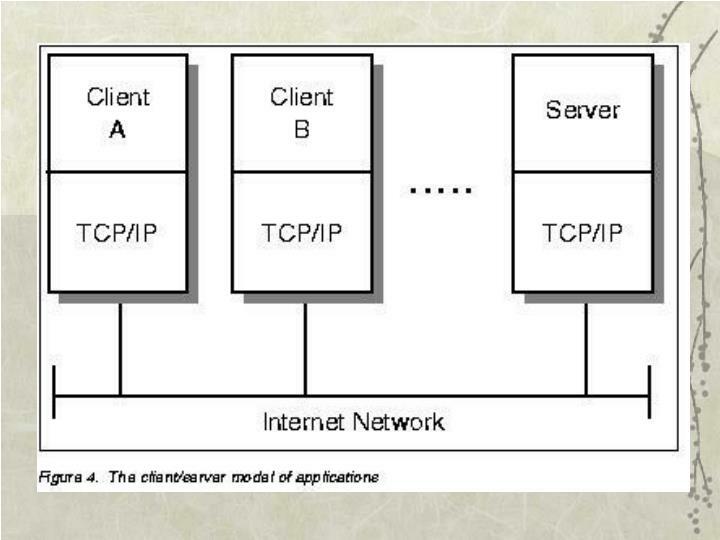 Most applications use the client/server model of interaction. 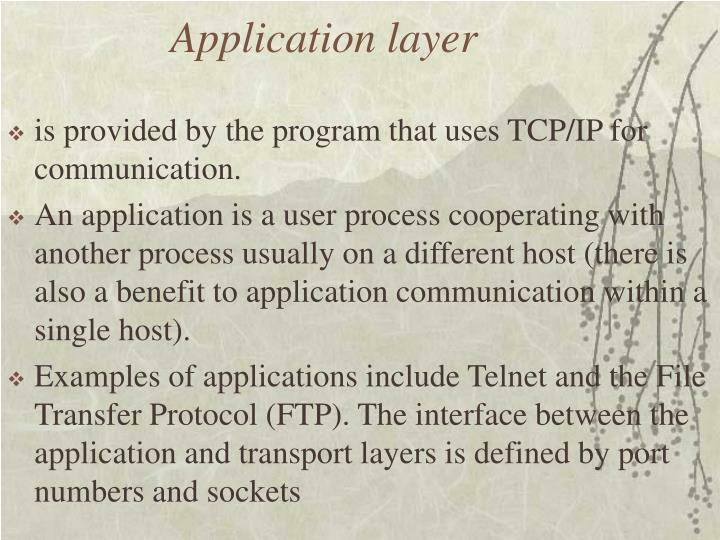 TCP is a peer­to­peer, connection­oriented protocol. There are no master/slave relationships. 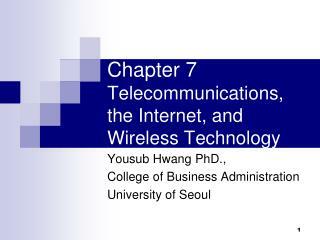 The applications, however, typically use a client/server model for communications. 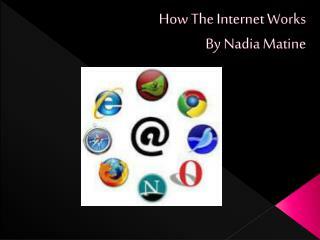 A server is an application that offers a service to internet users; a client is a requester of a service. An application consists of both a server and a client part, which can run on the same or on different systems. 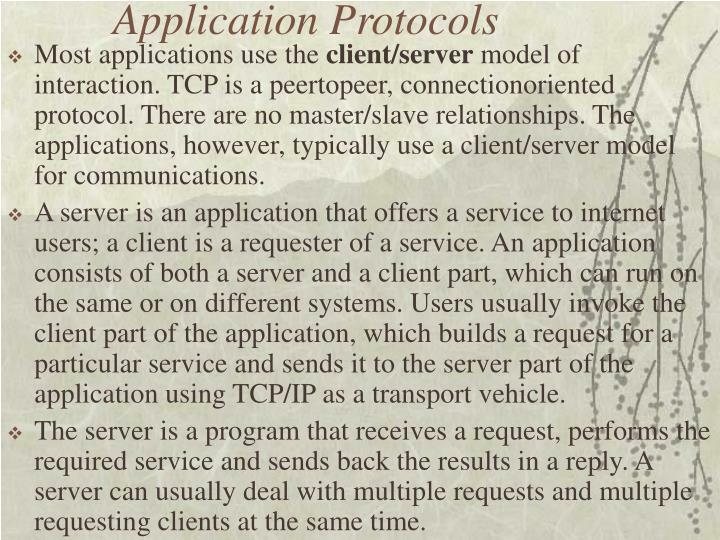 Users usually invoke the client part of the application, which builds a request for a particular service and sends it to the server part of the application using TCP/IP as a transport vehicle. 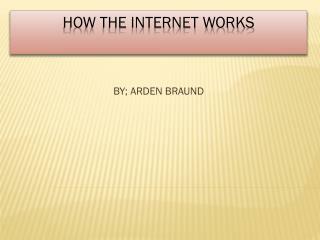 The server is a program that receives a request, performs the required service and sends back the results in a reply. A server can usually deal with multiple requests and multiple requesting clients at the same time. 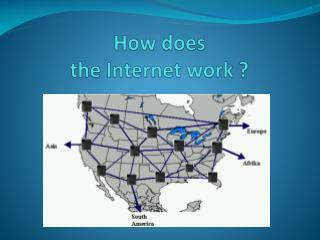 There are many ways to provide access to other networks. In an internetwork, this done with routers. 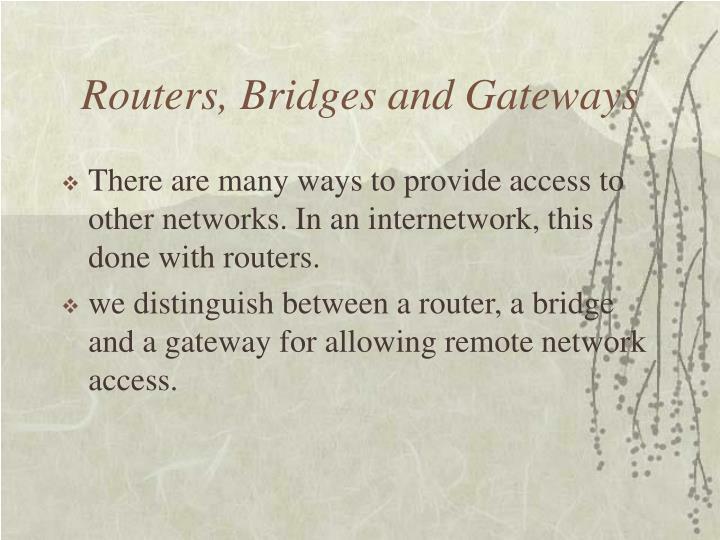 we distinguish between a router, a bridge and a gateway for allowing remote network access. A bridge Interconnects LAN segments at the network interface layer level and forwards frames between them. is independent of any higher layer protocol (including the logical link protocol). A bridge is said to be transparent to IP. 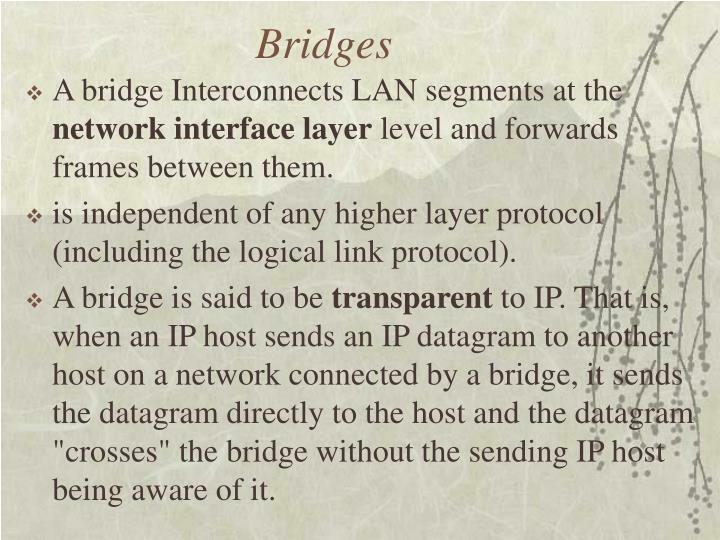 That is, when an IP host sends an IP datagram to another host on a network connected by a bridge, it sends the datagram directly to the host and the datagram "crosses" the bridge without the sending IP host being aware of it. 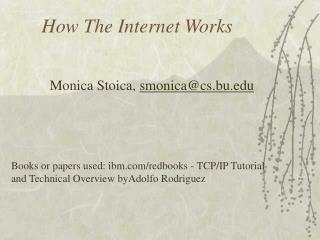 A router interconnects networks at the internetwork layer level and routes packets between them. The router must understand the addressing structure associated with the networking protocols it supports and take decisions on whether, or how, to forward packets. Routers are able to select the best transmission paths and optimal packet sizes. The basic routing function is implemented in the IP layer of the TCP/IP protocol stack, so any host or workstation running TCP/IP over more than one interface could, in theory and also with most of today's TCP/IP implementations, forward IP datagrams. However, dedicated routers provide much more sophisticated routing than the minimum functions implemented by IP. 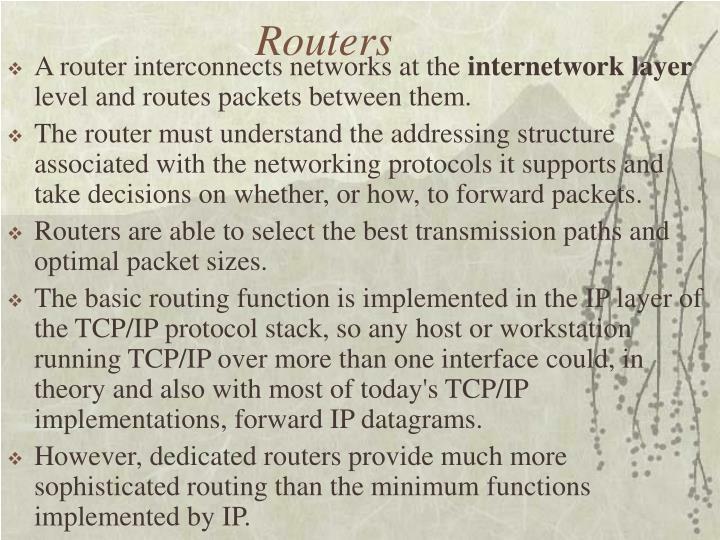 Because IP provides this basic routing function, the term "IP router," is often used. 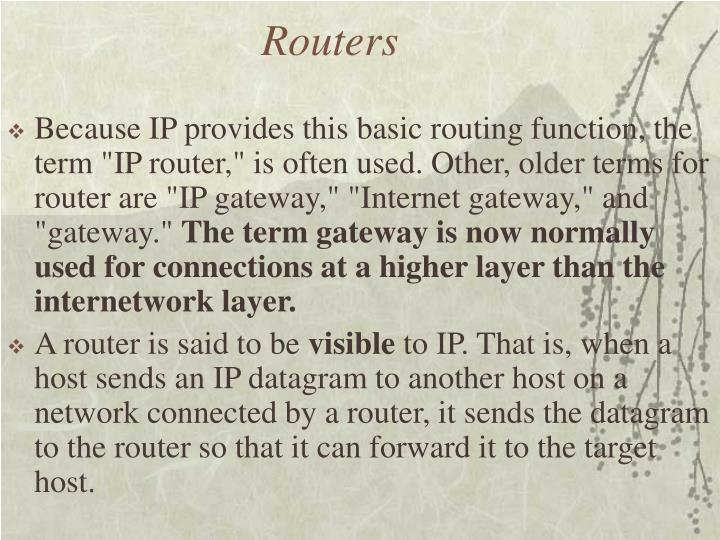 Other, older terms for router are "IP gateway," "Internet gateway," and "gateway." 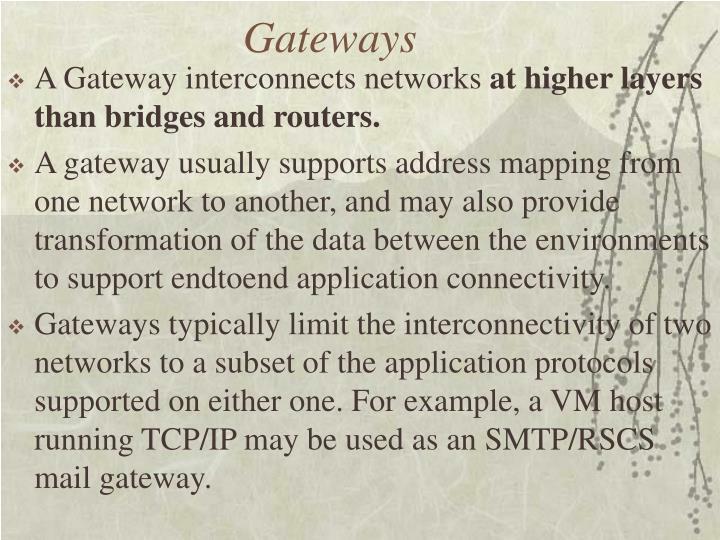 The term gateway is now normally used for connections at a higher layer than the internetwork layer. A router is said to be visible to IP. That is, when a host sends an IP datagram to another host on a network connected by a router, it sends the datagram to the router so that it can forward it to the target host. 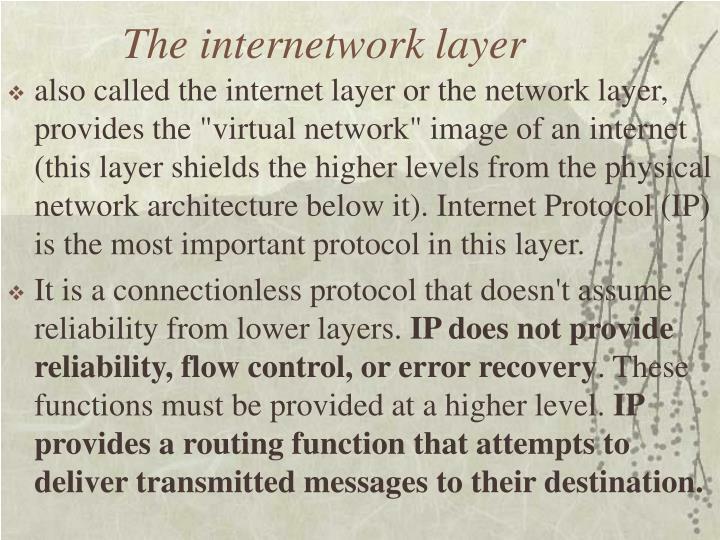 A Gateway interconnects networks at higher layers than bridges and routers. A gateway usually supports address mapping from one network to another, and may also provide transformation of the data between the environments to support end­to­end application connectivity. Gateways typically limit the interconnectivity of two networks to a subset of the application protocols supported on either one. For example, a VM host running TCP/IP may be used as an SMTP/RSCS mail gateway. 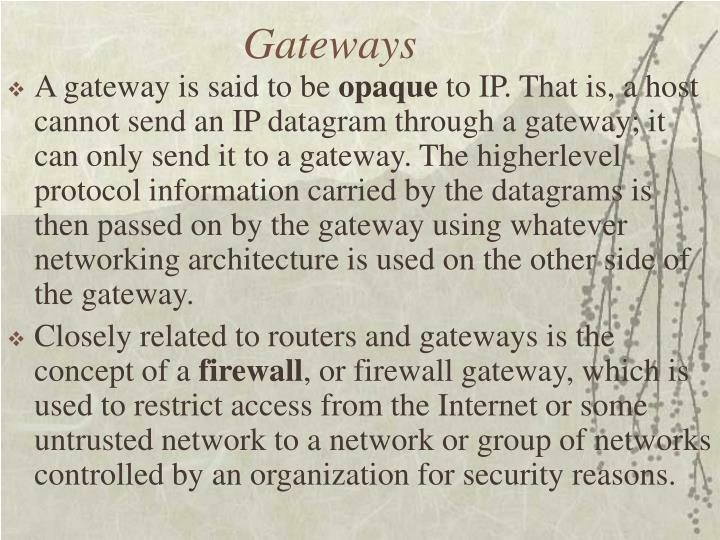 A gateway is said to be opaque to IP. That is, a host cannot send an IP datagram through a gateway; it can only send it to a gateway. The higher­level protocol information carried by the datagrams is then passed on by the gateway using whatever networking architecture is used on the other side of the gateway. Closely related to routers and gateways is the concept of a firewall, or firewall gateway, which is used to restrict access from the Internet or some untrusted network to a network or group of networks controlled by an organization for security reasons. 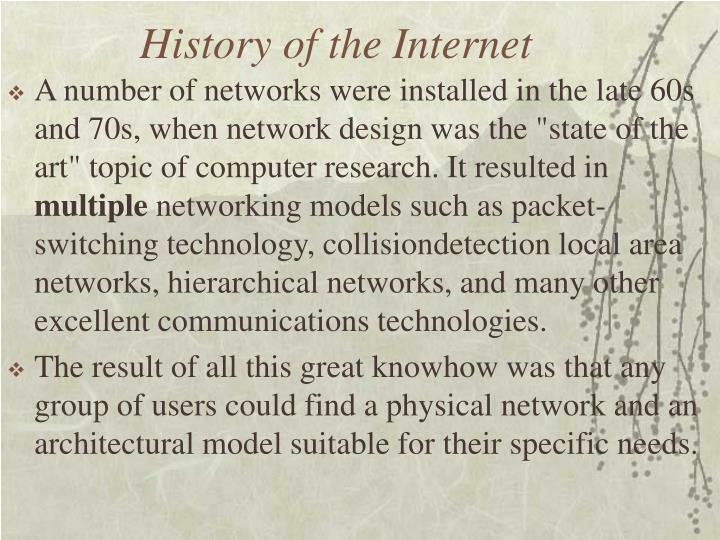 A number of networks were installed in the late 60s and 70s, when network design was the "state of the art" topic of computer research. 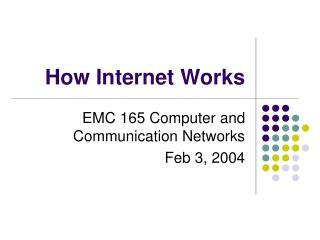 It resulted in multiple networking models such as packet­switching technology, collision­detection local area networks, hierarchical networks, and many other excellent communications technologies. The result of all this great know­how was that any group of users could find a physical network and an architectural model suitable for their specific needs. The down side of the development of such heterogeneous protocol suites is the rather painful situation where one group of users wishes to extend its information system to another group of users who have implemented a different network technology and different networking protocols. 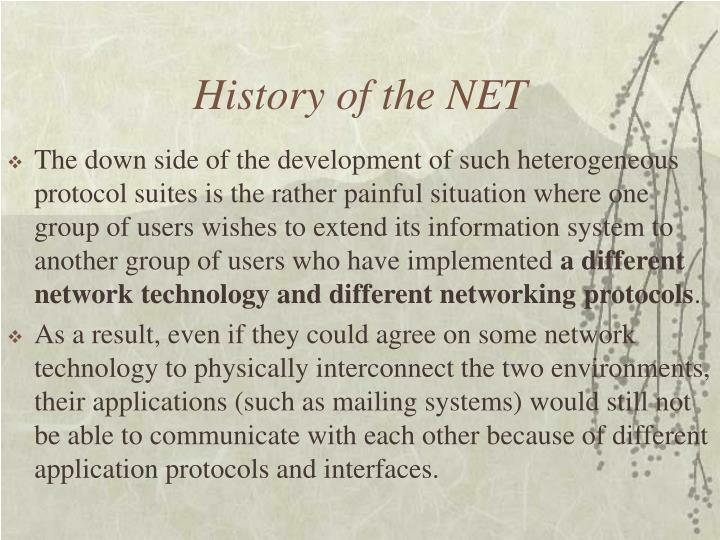 As a result, even if they could agree on some network technology to physically interconnect the two environments, their applications (such as mailing systems) would still not be able to communicate with each other because of different application protocols and interfaces. This situation was recognized in the early 70s by a group of U.S. researchers funded by the Defense Advanced Research Projects Agency (DARPA). 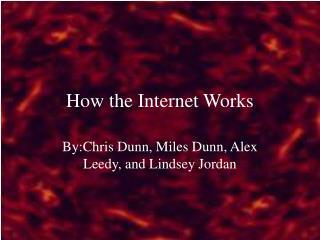 Their work addressed internetworking, or the interconnection of networks. Other official organizations became involved in this area, such as ITU­T (formerly CCITT) and ISO. The main goal was to define a set of protocols, detailed in a well­defined suite, so that applications would be able to communicate with other applications, regardless of the underlying network technology or the operating systems where those applications run. 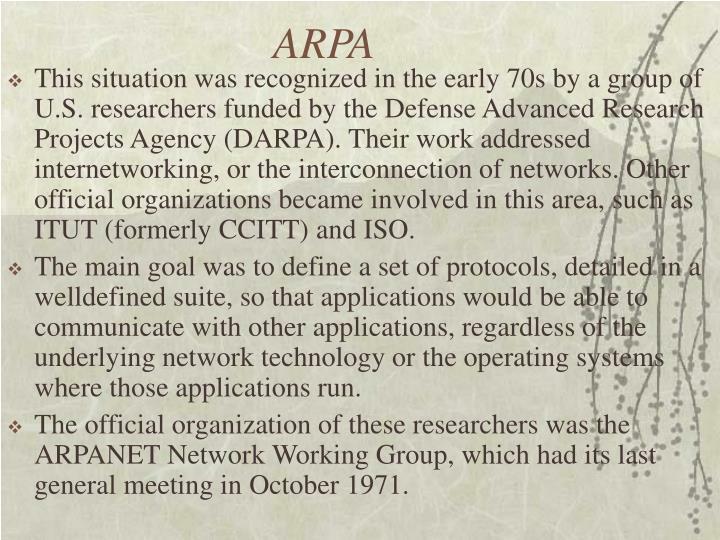 The official organization of these researchers was the ARPANET Network Working Group, which had its last general meeting in October 1971. 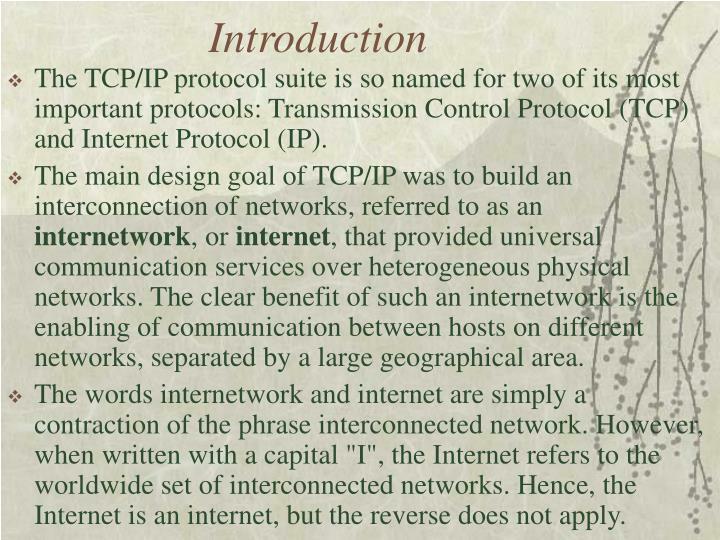 DARPA continued its research for an internetworking protocol suite, from the early Network Control Program (NCP) host­to­host protocol to the TCP/IP protocol suite, which took its current form around 1978. 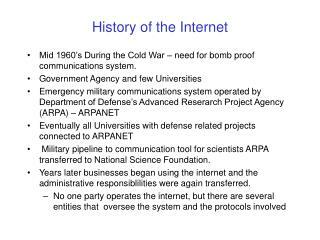 The first real implementations of the Internet were found around 1980 when DARPA started converting the machines of its research network (ARPANET) to use the new TCP/IP protocols. 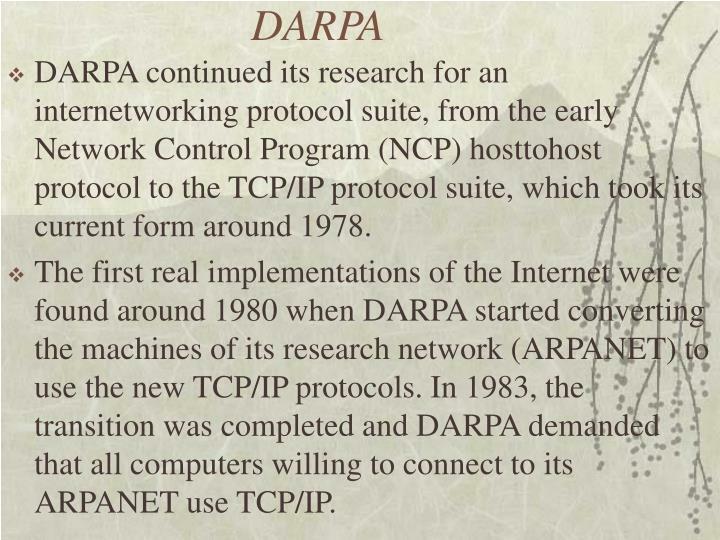 In 1983, the transition was completed and DARPA demanded that all computers willing to connect to its ARPANET use TCP/IP.